Congrats to all the five (5) filmmakers who won in the 2016 Cinemalaya-DGPI Film Pitching competition! 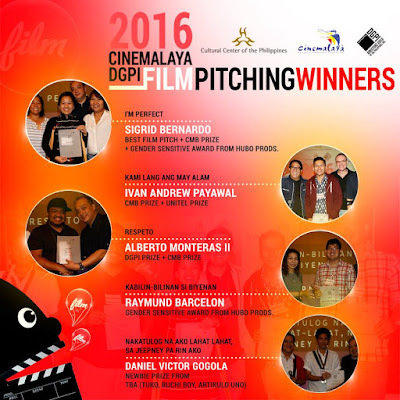 They are: Sigrid Bernardo, Ivan Andrew Payawal, Alberto Monteras II, Raymund Barcelon, and Daniel Victor Gogola. May your pitched stories find executive producers to finance your film productions soon!